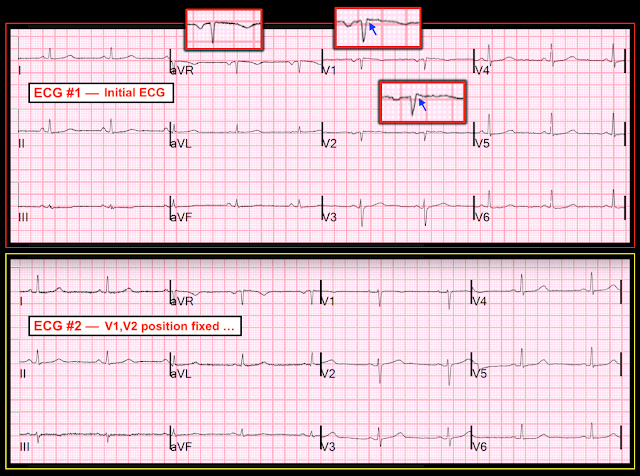 Dr. Smith's ECG Blog: Chest Pain and Q-waves in V1 and V2. Is there previous septal MI? A middle-aged woman presented with chest pain. She had no history of cardiac disease. The computer read was "Septal MI, age indeterminate"
Is it a septal MI? Septal Q-waves may be caused by placing leads V1 and V2 too high. With downward depolarization of the septum, it will be away from a high V2, but have a small deflection towards V2 when V2 is placed lower (correctly, just to the left of the septum). So perhaps leads were placed too high. How can we tell if our lead placement hypothesis is correct? Look at the P-wave in V2. It should be upright, but it is mostly negative. This happens when V2 is placed too high. --Think about it: when lead V2 is high, all atrial depolarization (proceeding caudally) is away from the lead and thus negative. --Another clue to leads too high are the R'-waves in V1 and V2. These are commonly a result of high lead placement. Misplacing V1 and V2 can have clinical consequences (full text). American Journal of Emergency Medicine 36(5):865-870; May 2018. She ruled out for MI by troponins. She had a normal echocardiogram, with normal shortening and thickening of the septum. 1. Learn to recognize misplaced leads. 2. Placement of V1 and V2 too high is very common and results in multiple mimics of pathology. 3. The computer will often not recognize these misplacements. 4. Re-recording the ECG in the correct position will verify or refute your suspicions. Important post by Dr. Smith regarding recognition of chest lead misplacement of leads V1 and V2. Two features about this pitfall amaze me: i) How surprisingly common this technical error is (In our informal study of internet-published examples supposedly illustrating “proper lead placement” — more than half of these published examples showed faulty lead placement! ); and, ii) How commonly emergency care providers fail to recognize this form of lead misplacement! The “good news” — is that it is EASY to suspect when V1/V2 misplacement is likely! CLUE #1 — If there is an r’ in leads V1 and/or V2, especially if the other finding for incomplete RBBB (ie, terminal s waves in lateral leads I and V6) is absent. CLUE #2 — If there is a significant negative component to the P wave in lead V1 and/or V2. CLUE #3 — If the appearance of the QRS complex and the ST-T wave in leads V1 and V2 looks very much like the QRS and ST-T wave in lead aVR. All 3 of these clues are present in ECG #1 (TOP tracing in Figure-1). This is the reason Dr. Smith immediately suspected placement of leads V1 and V2 in ECG #1 was probably too high. Figure-1: The 2 ECGs recorded in this case. One complex from leads aVR, V1 and V2 is magnified (within the RED rectangles) to facilitate recognition of subtle clues (See text). BOTTOM LINE — As per Dr. Smith, it is EASY to follow-up on your suspicion that leads V1 and/or V2 may have been placed too high on the chest: Simply verify lead placement yourself, as YOU repeat the ECG! As is evident in ECG #2 in Figure-1— the Repeat ECG shows: i) loss of the negative component to the P wave in leads V1 and V2; ii) loss of the terminal r’ in these leads; iii) development of completely normal R wave progression (with a small initial r wave now in V1, and a slightly larger R wave by lead V2); and, iv) loss of any resemblance between the ECG appearance of leads V1 and V2 with lead aVR. This confirms leads V1 and V2 were placed too high on the chest in ECG #1! That overall QRS voltage is relatively low. Criteria for “low voltage” are not met — because QRS amplitude is not ≤5mm in all 6 limb leads (ie, the R wave in ECG #1 is 6mm tall in lead II — and it is 7mm tall in lead I of ECG #2). However, QRS amplitude is relatively reduced in both limb leads and chest leads in both tracings. There is nonspecific ST-T wave flattening in leads III and aVF in both tracings, and the T wave is usually more upright in lead V6. In addition, the ST segment in leads V4-6 is straighter than usual. These are nonspecific ST-T wave changes that are not acute, but which should be recognized (For details — see My Comment at the bottom of Dr. Smith’s Oct. 27, 2018 blog post). NOTE: The patient in this case ruled out for MI because there was no significant change in serial ECGs; troponins were normal; and a normal Echo without wall motion abnormality was recorded. Did You Notice slight change in frontal plane axis (the QRS is now predominantly negative in lead III of ECG #2)? — and, earlier transition in the chest leads in ECG #2 (the R wave is now taller than the S wave by lead V3)? The earlier transition in ECG #2 makes me suspect that leads V1 and V2 may not have been the only leads incorrectly placed in ECG #1. P.S. : Although one should clearly consider the possibility of previous “septal infarction” in the presence of deep Q waves (or QS complexes) in leads V1 and V2 — in the absence of another Q wave (or QS complex) in lead V3 — the vast majority of patients with Q waves in V1 and V2 but not V3, will not have prior “septal” infarction. Clinical correlation, comparison with prior tracings, and verification of correct lead placement would all be needed for accurate comment on the likelihood of prior septal infarction. I would say these deviations are within normal limits. Nonspecific. Dr Smith and Dr Ken Grauer, thank you for sharing your expertise. I love your work! A Computer "Normal" ECG. What is the diagnosis?